Binger & Delgado Communications has been actively letting the business community know about the innovations available on the ESI Phone Systems. The ESI phone system has been well recognized by telecommunications industry leaders and awarded a thumb up for the advances made to its product line of ESI telephone systems and peripherals. The ESI telephone system comes complete with extremely user-friendly ESI telephones. ESI (Estech Systems, Inc.) designs, manufactures and markets advanced, highly featured business communications systems. Progressive vision, leading-edge technology, legendary reliability and award-winning products define ESI. Since its inception in 1987, ESI — a privately held corporation based in Plano, Texas — has shipped over 200,000 systems, and has enjoyed remarkable growth and uninterrupted profitability. All ESI phone systems deliver inventive and practical functions such as live call recording, live call screening, and the Verbal User Guide™. The science behind ESI Communications Servers is sophisticated, yet simple: each supports both digital functionality and IP-to-the-desktop, in any desired combination. ESI Communications Servers come in several models which vary primarily in capacity. Chances are that one will be just right for your workplace’s particular communications needs. Take just a few moments to learn how much an ESI Communications Server can do for your business. An amazingly capable business communications system. The innovative design of each ESI Communications Server means all vital business communications features you need are built-in — not added-on. 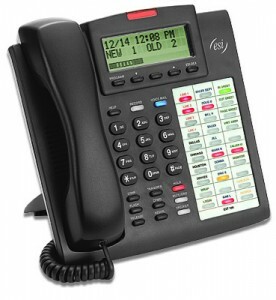 • A highly advanced, expandable phone system with extensive, unique call-handling features. • A tremendously flexible architecture that fully supports both digital- and IP-based communications. • Superior voice mail capabilities with exceptional features and messaging options. • A multi-level, highly customizable automated attendant for call routing. • Automated call distribution (ACD) to maximize your callers’ convenience. Grows with your business — intelligently. Whether you have many users and outside lines, just a handful of each, or something in-between, an ESI Communications Server grows with you. For modest call-handling needs, a smaller ESI system may do. From there, ESI’s larger platforms allow additional growth and customization. ESI’s patented, built-in voice mail maximizes both call-handling and voice mai storage. As your communications needs grow, you can easily and inexpensively add lines (including high-capacity trunks), phones, and special options — if and when you need them. Flexible enough to do the job, now and in the future. An ESI Communications Server is a fully flexible platform. It can be as digital-based, IP-based, or combined (digital- and IP-based) as you require. ESI has valuable experience with this technology: we were one of the first in our industry to create purely IP-based phone systems, as well as to add IP capability to digital systems. 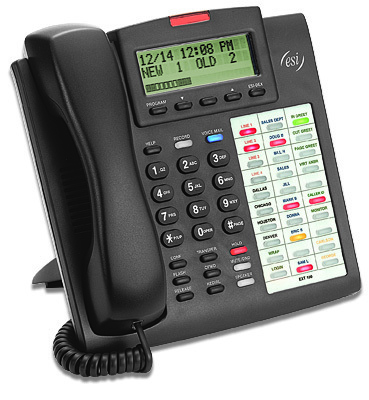 All ESI desktop phone models, both digital- and IP-based, provide advanced ESI phone features. This lets you tailor the phone choice to each user’s individual needs. ESI desktop digital phones provide superb, proven performance, and quickly plug into any digital phone jack. Want to save yourself the trouble and expense of wiring new phone outlets? ESI’s state-of-the-art desktop IP phones work from anywhere on your network. They also can go to most remote sites with broadband service, so executives and others can work from home while still having access to the office phone system and ESI features. Do you have multiple locations? You can connect up to 100 IP-enabled ESI systems on an Esi-Link™ network for more convenient communications and significant long-distance savings. In short: an ESI Communications Server can meet your business communications requirements today and for years to come.